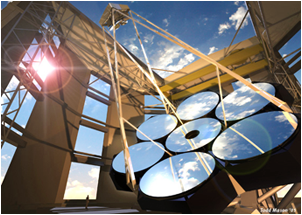 The Giant Magellan Telescope will combine seven 8.4-meter primary mirror segments into the equivalent of a 24.5-meter telescope. Photo courtesy of Giant Magellan Telescope - GMTO Corp.
KICP Workshop, First Annual GMT Community Science Meeting: "Cosmology in the Era of Extremely Large Telescopes"
Talk, Peter McGregor, Australian National University, "The GMT Integral-Field Spectrograph (GMTIFS): What It Can Do for You!" Talk, Andrew Szentgyorgyi, CfA, "G-CLEF: A Versatile, Optical Echelle Spectrograph for the GMT"
Talk, Darren DePoy, Texas A&M University, "A wide-field, multi-object, moderate-resolution optical spectrograph for the Giant Magellan Telescope"
Talk, Dan Fabricant, CfA, "NIRMOS: Wide Field Near-IR Imaging and Spectroscopy for GMT"
Talk, Patrick McCarthy, Director of the Giant Magellan Telescope: "The Giant Magellan Telescope"